ACE: Kandanga Tennis Club's Matthew Thompson, Rose Flower, Eli Gurnett and Mark Flower ready to put into action what they learnt from the JDS. 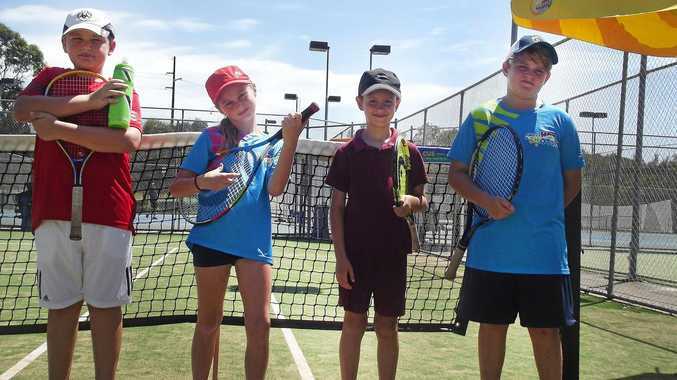 Tennis: Four players from the Kandanga Tennis Club took the first step in their careers competing for the first time in the Junior Development Series. Matthew Thompson, Rose Flower, Eli Gurnett and Mark Flower travelled to Mooloolaba last Sunday competing against about 40players from across the Sunshine Coast region. Club treasurer Steve Banney said the standard was high but these kids would take a lot from this. "Kandanga is a small club and these players have gotten a lot of experience competing in this competition," he said. "Unfortunately there were no winners from our club but they still had a lot of fun playing on the synthetic grass courts." The JDS is held across the regions of Queensland and players from beginner to intermediate are given the chance to hone their skills. This series is designed to give players their first experience in playing a series of tournaments throughout the year. Players receive points for each competition they play in and they can then be picked for a major tournament held at Rockhampton. "It was an eye-opener for our players to see how far they can progress with their tennis," he said. "They received exposure to an outside competition and play against a range of different players. "Hopefully there is a JDS program held at Gympie where we can enter more players." Banney said the kids at the club were being trained by Rob Schmitt every Wednesday afternoon. "He (Schmitt) is doing a great job" Banney said. "The four that have competed and any others will continue to be coached and can nominate to compete in the JDS."